If you have all-season tires on your vehicle, you might not be ready for winter driving in Warwick. While all-season tires are made to be durable and ready to handle most driving conditions, the harder rubber compound does not grip well when driving on snow or in extreme cold. 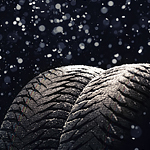 Winter tires are made of a different rubber compound that is much softer than that on all-season tires. They stay flexible and pliable even when it's cold out. The deeper tread pattern is designed to get rid of snow and water, and the many biting edges improve traction on ice and snow. To minimize wear on winter tires, it's important to have them switched out when the weather improves and the roads dry out. At Herb Chambers Maserati of Warwick, we can offer you sound advice on your different tire options and take care of putting the appropriate tires on for the different seasons of the year.